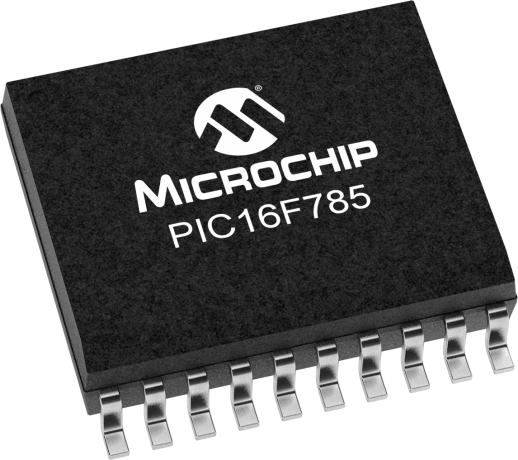 The PIC16F785 Flash microcontroller offers all of the advantages of the well recognized mid-range x14 architecture with standardized features including a wide operating voltage of 2.0-5.5 volts, on-board EEPROM Data Memory, and nanoWatt Technology. Analog peripherals include up to 12 channels of 10-bit A/D, 2 Operation Amplifiers, 2 high-speed analog Comparators, and a Bandgap Voltage Reference. Digital peripherals include a standard Capture/Compare/PWM (CCP) module, a 2-phase PWM with asynchronous feedback, a 16-bit timer and 2 8-bit timers.